My Braun 7681 Epilator Review: Is it worth the hype? If you’re like us, you’re tired of spending a lot of money on repeat visits to the beautician. Whether you’re shaving, using a cream, or waxing, it can get exhausting just trying to stay on top of your appearance and getting rid of those annoying little hairs. 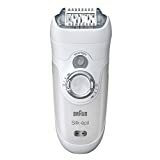 Today we will be discussing the Braun SE7681 Silk-epil Wet and Dry epilator. When we picked up the 7681 from Braun, we already knew about the kind of hype it was getting. Touted as “the most efficient wet & dry epilator” on the market, it can be used while having a bath or shower, or even afterwards. To be honest, though, using it while hair is as soft as possible not only makes the process much easier, but also much less painful. 40 tiny close-up tweezers provide fantastic accuracy, meaning that hairs as fine as half a centimetre thick can still be removed from the root for up to 4 weeks. The fact that it’s cordless is a very convenient touch, and the adjustable speed provides a much greater feeling of control and safety than some other epilators on the market. The High Frequency Massage feature and Pivoting Head also add to the comfort of using the Silk-epil 7 by making the plucking of hairs much easier, and by providing a flexible head that can pivot by up to 15 degrees. Included in the box is the Silk-epil 7681 itself, an optional shaver head, trimmer cap, sensitive-area cap (highly recommended! ), facial cap, efficiency cap, pre-epilation wipes, and a storage pouch. Each accessory is definitely useful for its purpose, and we highly recommend you use each of them as advised by the instruction manual. On removing the Braun from its packaging, the first thing we realised was how stupidly easy to use it is. We gave it a quick test run on our arms, and noticed right away that it was very intuitive to control and caused very little discomfort. Even the shorter hairs which we thought would be missed were completely gone. Right away, we started discussing how much more beneficial the Braun 7681 epilator is when compared to waxing. It’s cheaper (both in terms of per session price and long-term investment), and it manages to remove the hairs that waxing just won’t pick up. In terms of actual use, it can be a little painful when using it for an extended period of time. Follicles will go red, but after a short while they’ll fade away. You may also notice some dry skin, although to be honest this is nothing you can’t fix with some moisturiser. We found that after using the Silk-epil 7, you can realistically expect hair to be gone for a week. After that, you’ll start noticing that they’re growing back. However, thanks to the relatively pain-free process of using this epilator, it’s easy enough to quickly go over each area again before heading out for the evening. While we were slightly dissappointed to see that our skin wasn’t as smooth as it would be when shaving, the hair is showing much slower signs of growth and they are much finer than before too. While the Silk-epil 7 can seem like a fairly severe investment at $147, you can rest assured that you’re going to get your moneys-worth. If you consider that a bikini wax is going to cost anywhere from $30 – $100, and that you’ll need to get one every few months, it’s not hard to imagine that you’ll spend anywhere between $200 and $600 over the course of a year. The 7681 costs significantly less and you can expect it to last much longer, too. We really love that it can offer such an enjoyable and pain-free experience, especially considering that it’s so effective. If you’re going to use it around your bikini area, remember to lubricate the patch of hair first with some kind of petroleum-based oil. If hair is too dry, it can be an extremely painful and — depending on the area concerned — concerning experience! We’d also like to quickly point out that you should avoid using tea tree oil directly after epilating, as the combination of recently plucked skin and tea tree vapors can result is some severe discomfort! The 7681 is a definite recommendation from us. It’s a great product that makes the process of meaningful hair removal much easier, with less discomfort, awkwardness, and pain. It’s definitely not the cheapest model on the market, but the benefits you’ll experience compared to some of its competitors make it a genuine bargain. Don’t skimp on an epilator, buy a Braun Silk-epil 7681! Not what you are looking for? Check out more epilator reviews here. The 7681 stands out as a very effective epilator, and requires fewer passes than other models. It is one of the top epilators that I have reviewed. Copyright 2018 by Epilators for Women Reviews.